Megan Peters | DPS Aug 6, 2018. ANCHORAGE, Alaska – Alaska Wildlife Troopers are continuing their enforcement and patrol actions at commercial and personal use fisheries across the state. 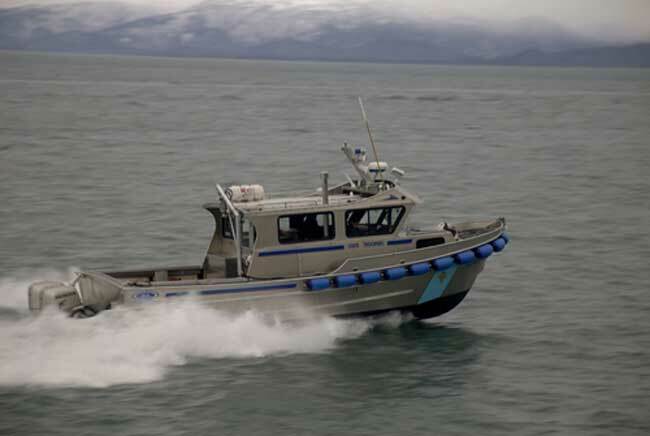 Recent patrol and surveillance efforts yielded a significant number of citations and charges related to illegal fishing activity in and around the Kenai Peninsula. On July 20th, during the early morning hours, a Wildlife Trooper made his way to Dog Fish Bay, South of Homer, on the patrol vessel Augustine. The Wildlife Trooper was able to set up in a location that allowed him to observe the bay, and the areas that were open and closed to commercial fishing that day. Four commercial fishing seine vessels were observed to be working together to drive salmon out of the closed water area towards the open water area, and illegally harvesting and transporting those fish. The vessels themselves as well as hand plungers were used by the fisherman in closed waters to drive the fish. The fish were caught by a set that occurred in open and closed waters. The operators of the F/V Little Star, F/V Relentless, F/V Northstar and F/V Windstar were all cited for commercial fishing violations as a result. A 5th vessel, the F/V Maranatha, was also present and used to illegally transport some of the fish illegally caught. In total, 33,328 lbs. of salmon were seized after it was delivered by the fishermen to a local processor vessel. Eric Winslow, age 61 of Homer, was charged with driving salmon, failure to provide information to a fish transporter, and failure to display vessel license numbers. Paul Roth, age 35 of Homer, was charged with driving salmon, commercial fishing in closed waters, and failure to provide information to the fish transporter. Robert Roth, age 39 of Anchor Point, was charged with failure to obtain a fish transporter permit, failure to complete fish tickets, and unlawful possession of commercial fish. Mark Roth, age 64 of Homer, was charged with driving salmon, failure to complete a fish ticket, and failure to display vessel license numbers. Charges were filed in Homer District Court. The AST case number is AK18051387. While patrolling a complex array of sport, commercial, personal use, or subsistence fisheries, and commercial, sport, or subsistence hunting seasons, Wildlife Troopers are fully commissioned Alaska State Troopers who independently recognize and act upon many other public safety emergencies, enforcement matters, and concerns. Wildlife Troopers often alone enforce state wildlife laws and regulations, without any support from local village or tribal law enforcement agencies.